I'm Rex Tillerson. 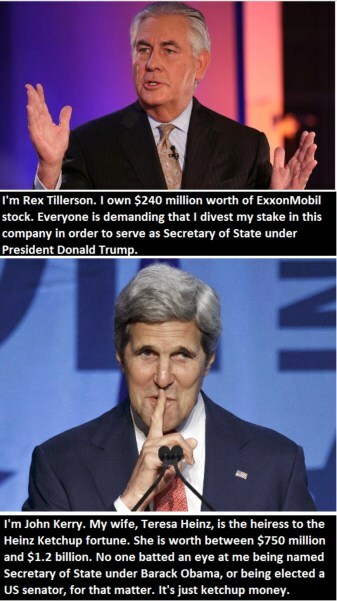 I own $240 million worth of ExxonMobil stock. Everyone is demanding that I divest my stake in this company in order to serve as Secretary of State under President Trump. I'm John Kerry. My wife, Teresa Heinz, is the heiress to the Heinz Ketchup fortune. She is worth between $750 million and $1.2 billion. No one batted an eye at me being named Secretary of State under Barack Obama, or being elected US Senator, for that matter. It's just ketchup money. Is it true that John Kerry's wife didn't have to divest her massive fortune into some type of blind trust while Kerry was Secretary of State? No one is required to have a blind trust or divest. The requirement is that the federal employee does not participate in a decision affecting the personal finances of himself or his spouse. No, it is not true that "no-one batted an eye". An independent review by the Office of Government Ethics warned about conflicts of interest, and both John Kerry and Teresa Heinz Kerry responded by divesting some investments. Kerry also pledged to avoid participating in topics that had a risk of conflicts of interest. Senator John F. Kerry and his wife, seeking to avoid possible conflicts of interest, will sell nearly 100 separate investments in the United States and abroad if the Massachusetts Democrat is confirmed as secretary of state. The decision to relinquish the assets within 90 days of taking the oath of office came after an independent review by the Office of Government Ethics determined that some of the Kerrys’ vast international holdings could run afoul of ethics laws in his new Cabinet post. It was also reported by Reuters and Politico. Does the the US Department of the State regularly send out Passport Surveys to random people?